Exactly Who Were the Bagnall Brothers? Well that's a difficult question to answer as accounts differ and it seems the "firm" may have changed hands amongst the brothers. My Grandfather was Harry Bagnall who originally lived on Stanley Road Wakefield. He died when I was quite young and his wife died before I was born. I can remember him when he got old he went to live in Oxford with his youngest daughter Norah. He came back to Wakefield to stay with his eldest daughter Gertrude Mary (my mother) at Albion Street Wakefield. I think this was about 1960 and it was always said that he came back to Yorkshire to die. It seems that as well as building much of Wakefield, much of what it was built from was made locally, in two (or more) brickworks. Mount Clay Brick Works and Wind Hill Brick Works. 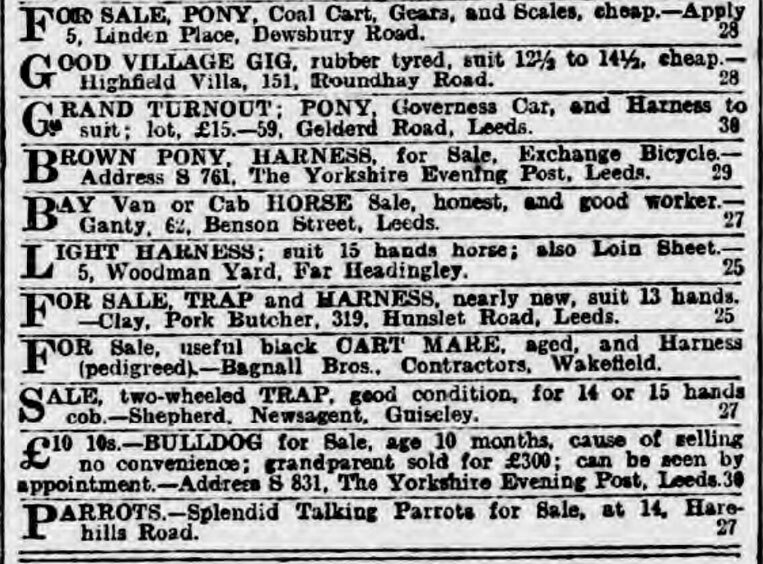 "WANTED, SPRING CART, and Second-hand HARNESS, to suit cob 13 hands, to lead few bricks and lime.-Apply Bagnall Bros., Contractors, Wekefield." Looking to sell 2 carts the following month! 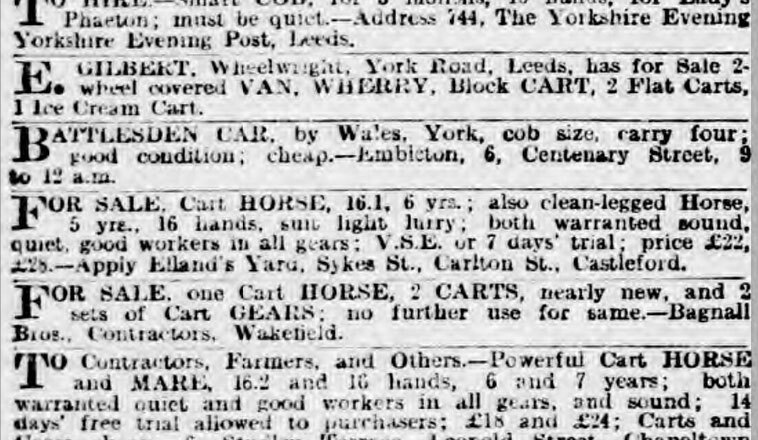 "FOR SALE, one Cart HORSE, 2 CARTS, nearly new, and 2 sets of Cart GEARS; no further use for same.-Bagnall Bros., Contractors, Wakefield." FOR Sale, useful black CART MARE, aged, and Harness (pedigreed).-Bagnall Bros. Contractors, Wakefield. WANTED, PIANO SCREEN, also a REPRESS: must be in good condition.-Bagnall Bros., Mount Clay Brickworks, Wakefield. To LET, HAULAGE of ONE MILLION BRICKS by traction or motor.-Apply Bagnall Bros., Mount Clay Brick Works, Wakefield. 1910 William & George Dissolve Bagnall Bros. It seems that from this notice in the London Gazette, from October 1910, on 17th October, George and William Bagnall dissolved the firm "BAGNALL BROS."
This advertisement in the Yorkshire Evening Post on 21st August 1912 implies that the running, possibly the ownership of the brickworks was in the Bagnall family. Perhaps George teamed up with Harry? JOINER WORK, 7 houses, labour only, -G. and H. Bagnall, Mount Clay Brickworks, Wakefield. It would be my assumption that this was George and Harry Bagnall. Patrick and I went to the Town Hall and met the Mayor, Cllr David Hopkins, who showed us two Mason's Mallets presented by Messrs Bagnall Bros to the Mayor. One, made from ebony was presented (I think) at the laying of a foundation stone for Alverthorpe Working Mens club. A building I didn't know they had built. The inscription reads G & H Bagnall which would indicate that Messrs Bagnall Brothers were George and Harry Bagnall. The other mallet is made from ivory and is unfortnately damaged, but I assume it may have been to commemorate the building of the Drury Lane Library. Many thanks too to Mr. Jubb for arranging our visit. Grandpa made at least 2 sorts of bricks, both I think were made to the Accrington formula, the orange ones and the blue ones. If you tried to drill through the blue ones the end of your drill bit usually dropped off before you got the hole drilled. These were engineering bricks which when I lived at 401 Aberford Road consisted of all the internal walls and the inside skin of the external walls. His brickworks, as far as I remember was on Ivy Lane opposite the entrance to Stanley Royd hospital. If he was building a large site, he made a brickworks on site, otherwise he had 70 pairs of horses and transported them to Kirkgate station, he eventually sold out to his friend Armitage Brickworks. The Normanton brickworks have a vast collection of bricks, that's if they're still in business. Grandpa's bricks are still evident after aprox 100 years and are all over Stanley and a lot of the schools he built are still going strong. He built most of Beeston area of Leeds which have been converted from back to back terrace houses to through terraces with Marble looking fireplaces and the ones that I have been in are in excellent condition. Bagnall Brothers was Uncles Jeffrey & Roland, Grandpa was Geo Bagnall, possibly & son.